A notice on Door to Door Organics’ website announces the closure. A Colorado-based online grocer that arrived in Richmond through a merger this year has abruptly shut down. 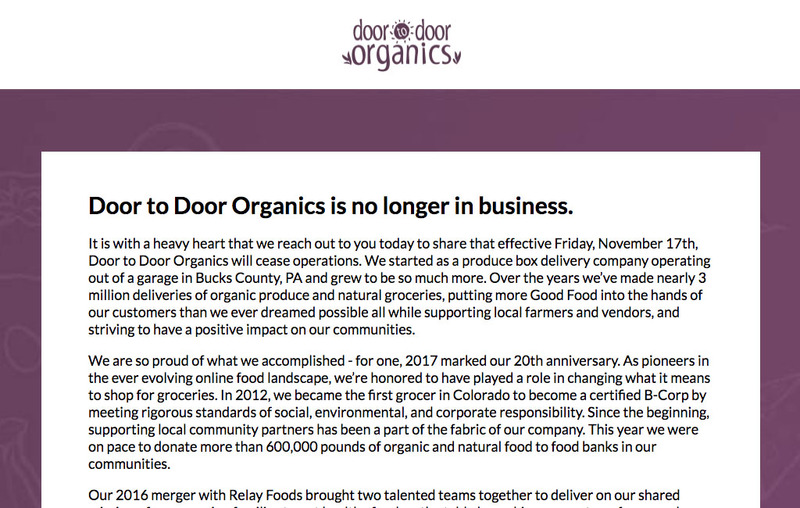 Door to Door Organics, which began delivering in the local market in early 2017 after combining with and subsequently dissolving Charlottesville-based Relay Foods, announced its closure Friday on its website. 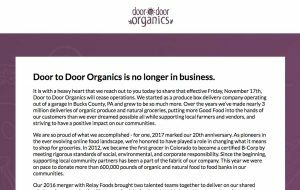 “It is with a heavy heart that we reach out to you today to share that effective Friday, Nov. 17th, Door to Door Organics will cease operations,” the letter reads. In June 2016, Door to Door merged with Relay Foods, which for a time had a sizable local operation out of a Scott’s Addition warehouse. Seven months later, Door to Door dissolved the Relay Foods brand and shuttered the warehouse, leaving Relay on the hook to return $100,000 in state and local grants to the government. Following that move, Door to Door continued delivery in the Richmond region with about 25 local employees, as of January. The message on Door to Door’s website, which is unsigned, hints at changes in the grocery delivery industry as reason for its closure. “In the end it’s hard to point to one thing that led us to this conclusion. Ultimately timing of recent events in our industry and the impact that had on our funding prospects were not in our favor with the ultimate result being no path forward,” it says. Door to Door representatives could not be reached for comment. The firm, which was headquartered in Louisville, Colorado, said it had raised $10 million in equity investment in conjunction with its merger with Relay in 2016. The company acknowledged the abrupt timing of the announcement as it relates to the coming holiday. “We know many of you had counted on next week’s deliveries for your Thanksgiving meal. We sincerely apologize that we are unable to meet your family’s needs on this occasion,” the letter reads.